After several bad luck stories over the last few seasons in my pursuit of seeing a match in Newport, I finally made it to my Shangri-la at the fourth attempt, thanks largely to Squad#169 Geoff Jackson, together with international egg chasing and a trip to Salisbury the previous day. I departed Wiltshire on the very busy 1026 First Great Western service to Cardiff Central, which was running 15 minutes late, but I still had sufficient time to call at the four Wetherspoons pubs before the match. Newport (Welsh: Casnewydd) is a cathedral and university city in south east Wales, located on the River Usk close to its confluence with the Severn estuary. Newport as a settlement was first mentioned as “novo burgus” established by Robert, Earl of Gloucester in 1126. The name derived from the original Latin meaning new borough or town. Newport is renowned for its port, going back to medieval times when a castle was built by the Normans. The port grew significantly in the 19th century with the export of coal from the eastern coalfields of South Wales, becoming the largest Welsh exporter of coal until the emergence of Cardiff in the 1850s.The docks declined during the 20th century, however Newport remained an important manufacturing and engineering centre. The town was granted city status in 2002 and is largest urban area within the historic county boundaries of Monmouthshire and the preserved county of Gwent. The Newport & Monmouth County Association Football Club formed in 1912, playing in the Southern League and were originally nicknamed "The Ironsides" in recognition of the Orb steel works. Newport County reformed in 1919 and were elected to the Football League as founder members of Division Three South the following year. They were not re-elected after the 1930–31 season but rejoined for 1932–33, winning promotion to the Second Division as champions in 1939, the highest level the club played in during their Football League career. 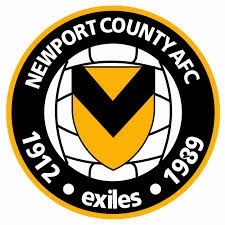 The rise and fall of Newport County came in an eventful era during the 1980s. The decade began with promotion from the Fourth Division and finally winning the Welsh Cup which gained entry to the 1980-81 European Cup-Winners-Cup. The Euro adventure saw County progress past Crusaders (Northern Ireland) Sk Haugar (Norway) before a quarter final clash with East German side Carl Zeiss Jena. After drawing 2-2 in the away leg, County lost out by a narrow single goal defeat in front of 18,000 at Somerton Park, which denied them a semi-final clash with Benfica. After such a high the decade ended with the club going out of business under the ownership of American Jerry Sherman. The decline began with relegated from the Third Division in 1986-87, before dropping out of the Football League the following year after 60 seasons. They failed to complete their first season fixtures in the Conference, as their record was expunged before finally going out of business on the 27th February 1989 with debts of £330,000. Newport AFC reformed in June 1989 by 400 supporters including David Hando as Chairman and who was later appointed the club president.The road back to ‘The 92’ began with election to the Hellenic League playing home games in the Gloucestershire town of Moreton-in-Marsh, which gave them the nickname "The Exiles" as Newport Council refused permission to use Somerton Park on the grounds of unpaid rent by the former hierarchy. 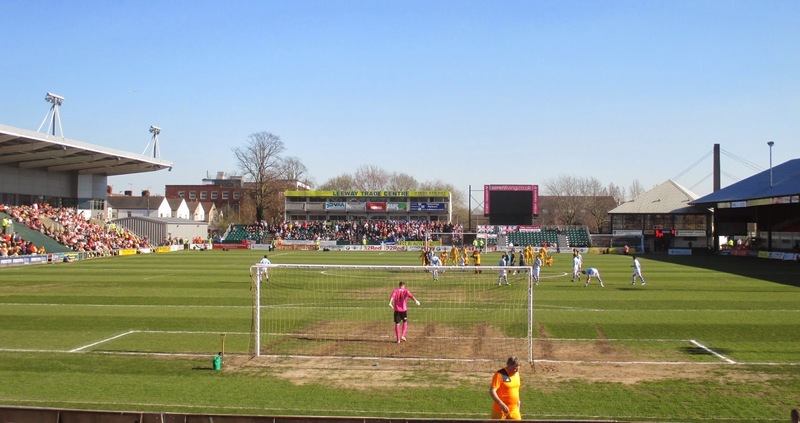 In their debut season the club won the title and progressed through the Southern League, on route playing matches at Gloucester City’s Meadow Park ground and regaining the Newport County name in 1999. The club were Conference South champions in 2010 and after almost a quarter of a century returned to the Football League in their centenary season, winning last year’s Conference play-off final against Wrexham at Wembley. 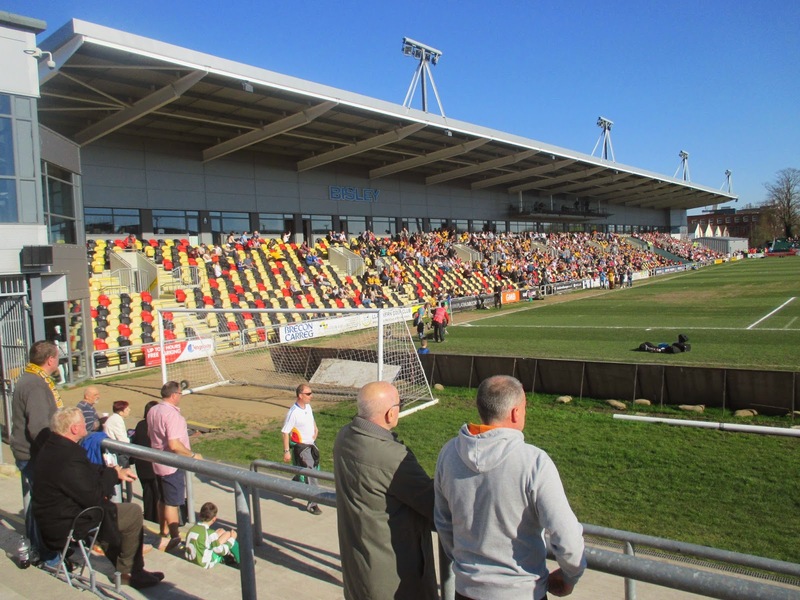 The Exiles returned to Newport for the 1994–95 season at the newly built Newport Stadium. 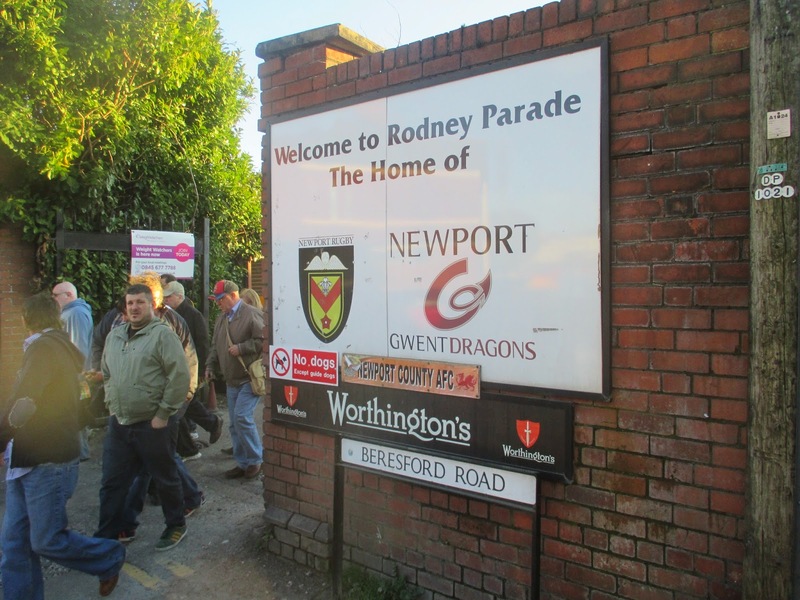 In May 2012 the club announced an agreement to share with the city’s Rugby club Newport Gwent Dragons at Rodney Parade, with the lease extended to a 10 year deal from February 2013. 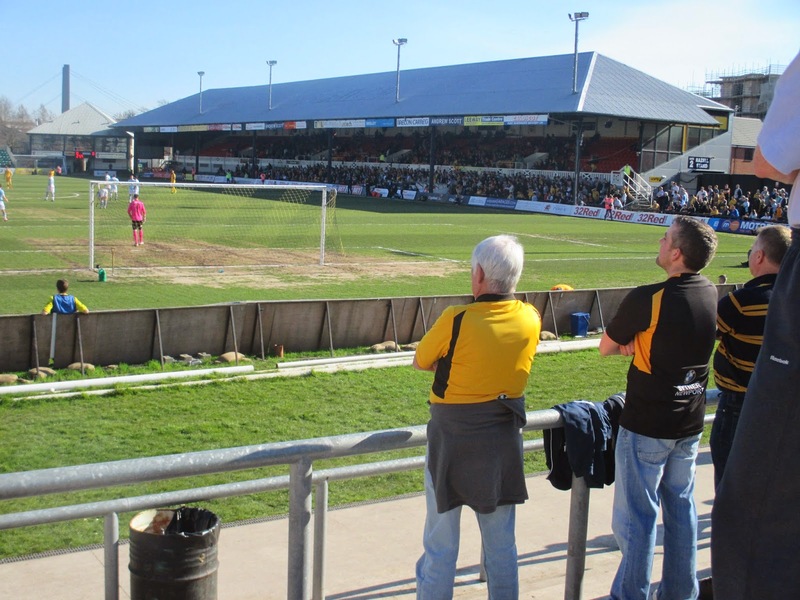 Rodney Parade sits on the east bank of the River Esk and dates back to the 1877, following the formation of Newport Athletic Club, which formed two years earlier and purchased use of the land from Lord Tredegar for their cricket, tennis, rugby and athletics teams. The cricket ground on the site was also used by Monmouthshire County Cricket Club between 1901 and 1934 and later Newport Cricket Club, until the land was sold and the new Maindee primary school was built. The stadium has two new stands on the west and east sides of the ground. 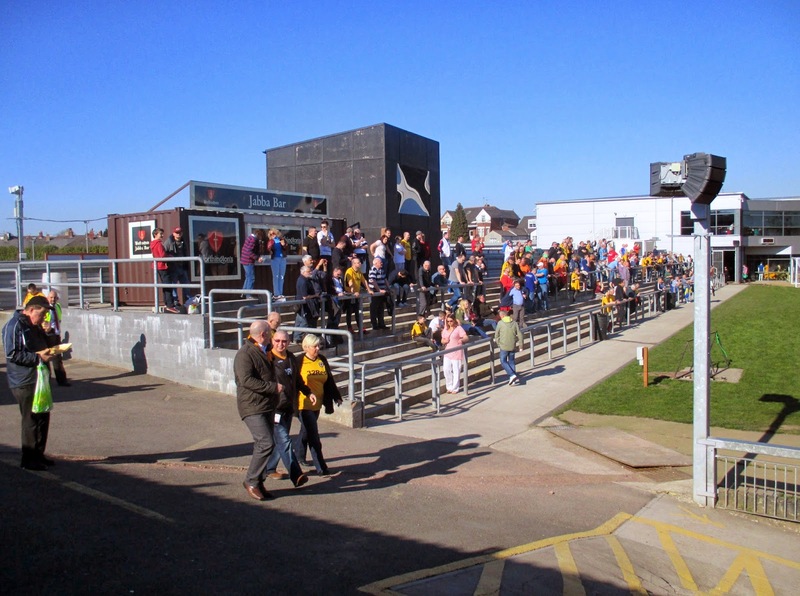 The Bisley Stand (east) was built in 2011 and is a pitch length single tier structure, neatly decked out in random yellow, black and red flip seats. The stand has a 2,526 capacity with 13 hospitality boxes and houses the TV gantry. Opposite is the Hazell Stand which has more of a traditional look to it, with an upper tier of 1,996 red seats and a standing paddock at the front. There are 4 floodlight poles popping out of the peaked roof, with windshields on both sides. I stood on the North Terrace which is uncovered with the standing area extended around to the west stand. Behind the south goal is some newly installed green flip seats in front of an office building and an electric scoreboard. The changing rooms are found in a separate building in the south-east corner, plus the ticket offices, club shop and a cracking portakabin programme shop are found at the north entrance. The League Two clash with Exeter City was switched to a Sunday kick off because of the Six Nations Rugby International between Wales and Scotland in Cardiff the previous day, which suited my plans perfectly for this weekend. After a no score draw the previous afternoon and an uneventful first half at Rodney Parade it was looking as if I wouldn’t see the ball hit the onion bag all weekend, but like the proverbial double-decker bus, two came along together. The visitors took the lead on 51 minutes when a long ball over the top found Tom Nichols free down the right, his left footed cross was intercepted by defender Harry Worley, who glanced his headed clearance into his own net past the shocked ‘keeper. From the restart it was all square when a deep cross from Willmott found Zebroski who nodded the ball into the path of Minshull, to poke home the equaliser from six yards. The best chance of a winner came late on when a jinky run and shot from Zeboski forced a good save from Krysiak, but on the overall balance of play, a share of the spoils was the fairest outcome. Before the match I met up with Squad#169 Geoff Jackson, who along with his son Daniel(who is well on his way to 100 grounds)had travelled down from Carlisle to Salisbury the previous day, but stayed overnight in Newbury, before driving along to Newport for the game. Geoff was good enough to assist me in this weekend double by avoiding the A66 exit off the A1 to Cumbria, instead carrying on up the motorway to drop me off back in Gateshead. The five and a half hour journey back north wasn’t too bad, as Geoff was great company and didn’t button his lip for the 300 mile trip from Gwent to Tyneside. I finally arrived at Gallowgate View at 11pm, tired but delighted to have not just re-completed The 92, but also achieved a more mightier landmark. I mentioned at the top of this post that I did a pre-match ‘Spoons pub crawl and the second of those four boozers; the Queens Head was the 200th Wetherspoons pub that I’ve had a bevvy in, which is further proof that there’s still no getting away for my OCD - JDW problem.